Pizza Tots are the ultimate football party food! 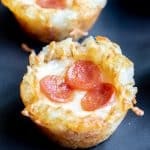 Crispy tater tot cups filled with pizza sauce, melted mozzarella and mini pepperonis. Every bite is a pizza explosion. Fill each tater tot cup with a heaping 1/4 teaspoon of pizza sauce, 1 tablespoon mozzarella cheese, and 3 mini pepperonis. Remove the pizza tots from the oven and let cool for 5 minutes before removing them from the muffin pan.